Not long ago, I suddenly realised that one part of my cooking that had disappeared completely during the first weeks of my job was the home made curry. It’s not because they take too long to cook. I can pull together a decent Goan fish curry in about half an hour. Instead it’s the attention to detail that is the problem. When making a curry I find I need to be really on the ball. The spice quantities in recipe books or on the web aren’t ever quite right and I find I need to be there tasting and adjusting constantly if I want it to be good. However, it has now got to the stage where Goon seems to have given up cooking completely so, it’s in the door at 9pm for me and straight into the kitchen. Even after just a week of that it got to the stage where I managed to cook, serve up and then fall asleep on the sofa before I managed to eat. I was woken up half an hour later by Goon who had managed to scoff most of my portion as well as his and was trying to shoo me away so he could get to his favourite programming spot in front of the television. Let this be a warning to you:never share a flat with a geek,especially one who doesn’t like cooking. There’s no way I could manage to make something that requires concentration whilst I am in that state of exhaustion so home made curries might have to become a holiday treat. This half term, I wasn’t going to let the opportunity pass me by so, during a Friday visit to Borough, I picked up my favourite currying meat, came home and made this. 300ml (or just enough to cover the meat in step 2 below) home made lamb or beef bone stock (nothing herby). Water will do as the mutton has a rich flavour of its own, but I much prefer using a simple bone stock. Brown the mutton pieces on all sides over a high heat in the oil/ghee. Remove with a slotted spoon and set aside. Turn the heat down and add the onions to the saucepan. Fry gently until they start to soften. Add the spices, garlic and ginger. Once the onion is cooked, return the mutton to the pan, barely cover with the stock, place the lid on the saucepan and simmer for around 2 hours. Keep an eye on the curry and, if it starts to become too dry, add a little more stock. In a seperate pan, fry the pepper until soft, then add this to the curry with the chillies. Stir the curry well and continue to let it simmer for another five minutes so it takes on the flavour of the peppers. Taste and adjust spice balance if necessary. Wilt in the spinach. 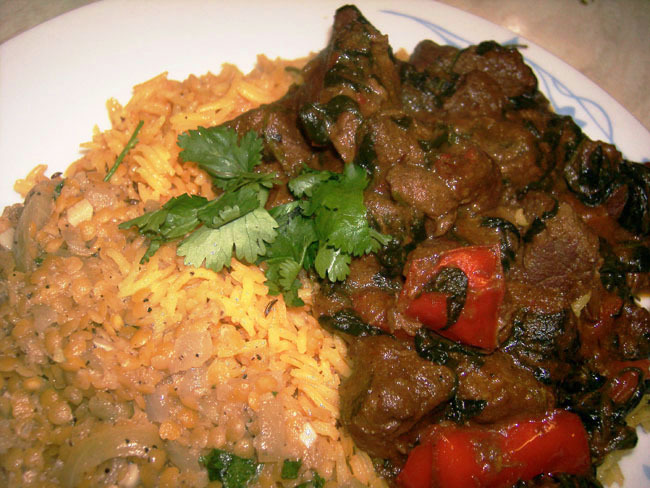 Taste, adjust seasoning and serve over pilau rice, perhaps with a lentil side dish. As far as curries go, this one has a relatively short ingredients list. it includes the staples of coriander and cumin, but contains few other spices. The distinctive flavour of this curry comes instead from the red peppers. An excellent accompanient to this dish would have been a naan bread flavoured with garlic and cumin, but my baking skills still aren’t up to much, so I went with spiced pilau rice and some garlic dahl instead. After a long seven weeks of no home made curries, this was a breath of fresh air. A take-away hasn’t got the freshness and vibrancy of home made Indian food so I’d urge anyone to try making their own at least once, even if time constraints mean it can’t be a regular occurence. Start with a decent recipe, but always be prepared to adjust the spice levels to suit your own taste. It looks like it will be another five weeks at least until I get another chance to do curry, but, given its game season that is probably for the best. It is now the season for rabbit pie and roasted pheasant, so I’d better get myself to Borough soon.